Christiansted is the lively, bustling heart of St Croix. It's one of the island's most popular destinations. Of all the US Virgin Islands cities, it most gracefully combines the rich colonial history and culture of the islands with modern tourism. Situated on St Croix's north shore just a few miles east of the Salt River, the town offers a host of appealing attractions and activities. Many of St Croix's best hotels and resorts are in and around town. There's also an excellent selection of restaurants for you to try. Fine shopping, nightlife, a full array of sporting activities, and some of the best historical attractions in the Caribbean all add up to offer you a great experience during your stay. In fact, it's this near-perfect balance of different elements that, for many people, makes Christiansted the ideal Caribbean town. Christiansted, St Croix was planned in 1734 by Frederik Moth, the first Danish governor, the year after Denmark purchased the island from France. The town was built up over the following decades. By the 1740's, strict protective building codes were instituted. 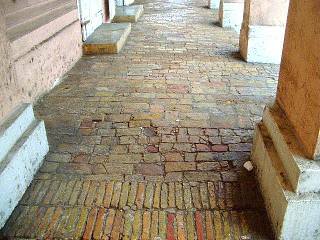 It's because of this that many of the city's original structures remain to this day. In 1755 the city became the capital of the Danish West Indies, leading to an increase in population and commercial importance through the rest of the 18th Century. A decline in the sugar-based economy during the 1820's led to a dormancy that's probably responsible for the preservation of the original colonial town. Burgeoning tourism in the 1950's and 1960's meant the development of many of the modern attractions like shops, restaurants, and hotels that have become an integral part of the city. There's all sorts of things for you to see and do here. I really recommend that you tour the town - at least the central historic district - on foot. Narrow one-way streets mean the traffic can become congested, especially in the mornings and evenings. Mostly shaded sidewalks and a compact layout make walking around the town a pleasure. You can park in one of two public lots in town, or in designated street parking. I suggest you allow at least a long morning (better yet, a whole day) to fully explore the town. Street to the southwest, Queen Street to the southeast, and the waterfront to the north. The best time of day to explore is between morning and evening rush hours, from 10 AM to 4 PM. 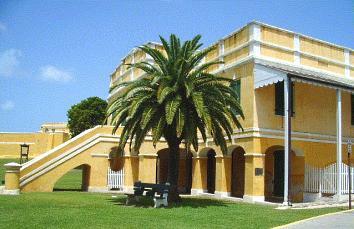 Covering nearly 30 acres, this site contains five classic Danish Colonial buildings open to visitors. Fort Christiansvaern was built to protect the town from attack by pirates and privateers and to enforce collection of customs duties. It also housed Danish troops for the purpose of port defense and to prevent slave revolts. It was erected in 1749 and substantially enlarged around 1835. For a detailed look at Fort Christiansvaern, click here. The Steeple Building, built in 1751, is an attractive white rectangular structure that was originally the first Lutheran church on St Croix. When the congregation moved to another location in 1831, the building was used over the years as a storehouse, a school, a hospital, and even a bakery! The Old Danish Scale House, built in 1856, is the place where giant hogsheads loaded with sugar were weighed before exportation. The huge scales, still visible as you enter the building, were also used to weigh imports. The building now functions as the National Park Service Information Center and Visitors' Bureau. The Customs House, just across from Fort Christiansvaern, is the place taxes were paid on imports and exports passing through the Scale House right next door. The Danish West India and Guinea Company Warehouse is just across the intersection from the Customs House. This was the headquarters for The Danish West India Company, and housed goods, offices, staff, and slaves. It was originally three times larger than the current structure, and its courtyard hosted some of the biggest slave auctions in the Caribbean. Still not enough for you? To see even more attractions and sights in Christiansted, click here.